Back from near oblivion, Phoenix has a new owner and a 35 convertible as resilient as her namesake. The Phoenix is synonymous with rebirth and resiliency: In Greek mythology the bird infinitely repeats a cycle in which it lives for 500 years, is consumed by fire, and then miraculously rises from the ashes to live another 500 years. Little did the original owners of Phoenix Marine know how appropriate this image would be when they named their company after that storied bird. 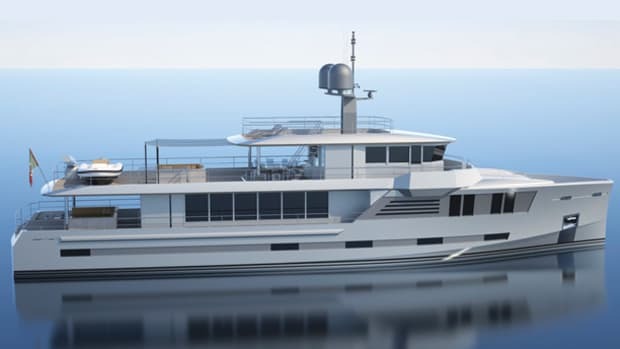 Now, after ceasing production last February, this Phoenix has returned to life, thanks to Carl Herndon, president of Jupiter Marine International, which acquired Phoenix last year. 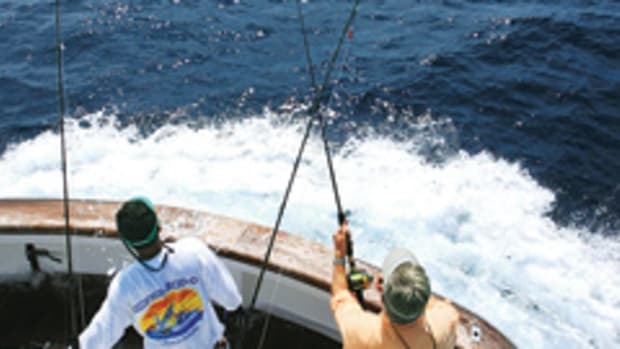 Herndon is best known for founding Blackfin Yachts and being president of Bertram Yacht from 1994 to 1996. 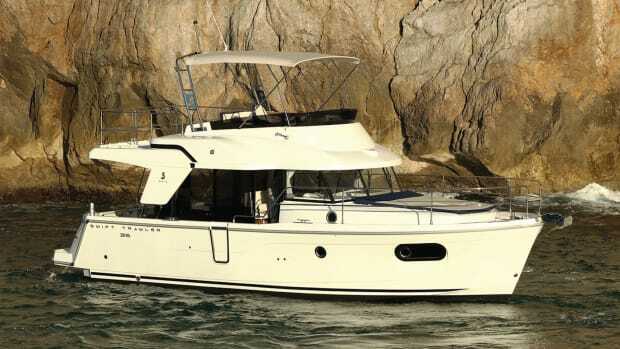 The first new Phoenix to emerge from these ashes is the 35 Flybridge Convertible. It was January in New York when I got a chance to defrost at the helm of this reincarnated firebird and see what modifications Herndon had made to bring her back to life. As my plane accelerated down the runway of Kennedy International and I left a frozen Big Apple behind, I waved goodbye to all the shivering city-dwellers. 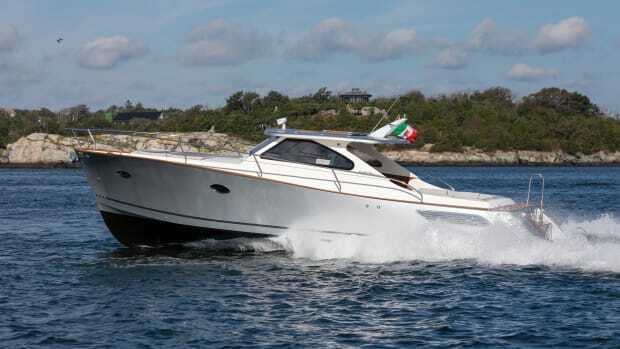 The 35 is based on the popular Phoenix 34 SFX, which was introduced around 1997 and is the product of a multitude of modifications. 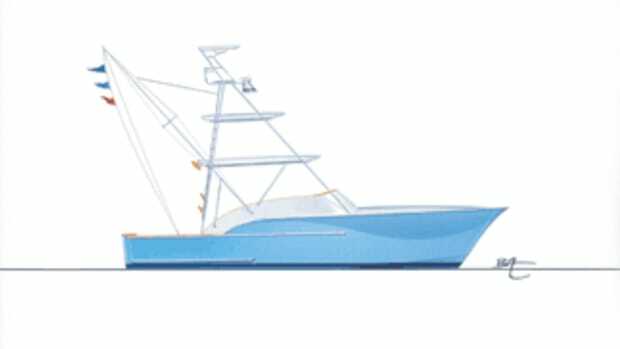 For starters, Herndon says he wanted a more contemporary, rounded, Euro-looking profile, so he spent six months consulting Phoenix owners and dealers to see how he could incorporate these features into a legitimate sportfisherman. The first thing he and his staff did was to remove the 34&apos;s hull vents, which immediately cleaned up the profile. To ensure the engines receive an adequate supply of combustion air, the design team replaced them with hidden scoops in the pilasters containing S baffles (a trick he used at Blackfin) to prohibit saltwater intrusion and reduce engine noise. In the 34 the pilasters met the flying bridge overhang at a sharp angle, so Herndon and the designers rounded off this area and removed striations in the pilasters to produce a softer look with a lower profile that looks fast sitting still. 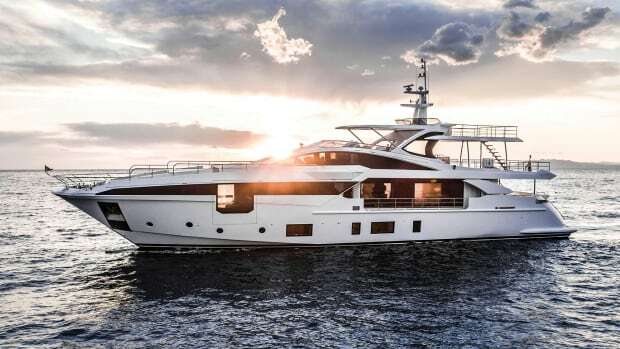 They also added about a foot to the foredeck to make the boat a 35 and lowered and curved the windscreen to further enhance the streamlined appearance. As a result, this boat is stylish but still looks like she was built to fish. In addition to aesthetics, Herndon also focused on practical changes. He replaced the balsa coring used in the 34&apos;s hull sides and side decks with PVC foam coring because, he says, PVC will not rot, and he added glass from the engine room bulkhead aft to stiffen and reinforce the overall structure, which added some weight. (Our test boat came in around 23,890 pounds.) He also beefed up the fiberglass-encapsulated stringer system, which is laid up outside the hull and then installed about two-thirds of the way through the building process. He also made sure the hull-to-deck joint is bulletproof, sealing it with 3M 5200, mechanically fastening it, and then glassing it all around. Feeling that the 34 was slightly bow-heavy and looking to enhance its seakindliness, Herndon moved the center of balance aft about nine inches by repositioning the genset, engines, and fuel tanks. (After seeing the 35&apos;s back-straight, lady-like posture at the Cozy Cove Marina in Fort Lauderdale, I&apos;d say it was the right call.) In the process he also managed to gain 100 gallons of fuel capacity, for a total of 400 gallons. 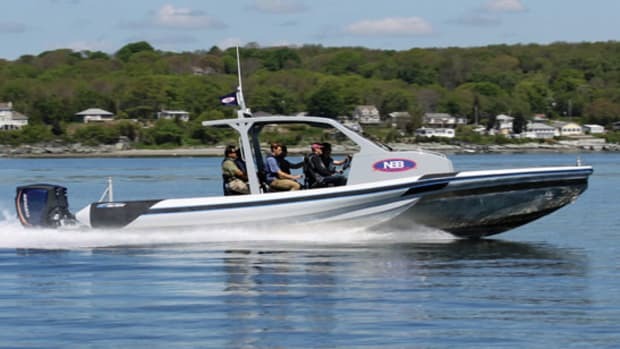 Other handling enhancements included moving the standard Bennett trim tabs outboard where they could exert more leverage and increasing rudder size by about 30 percent, improving helm response. The moment I stepped into the 35&apos;s cockpit, I could see Herndon hadn&apos;t forgotten about fishing. I immediately noticed the standard 30-gallon in-deck livewell to port and 46-gallon in-deck fishbox to starboard, right behind the transom door. As a result, you need only drag your catch about a foot to stow it out of the way. There are also five rod holders (standard) and ample rod stowage to port and starboard, with benchseating on top of the engine covers and tackle drawers to either side. Optional amenities included a half tower, Lee 19-foot, double-box outriggers, and rocket launchers across the flying-bridge rail. Herndon even took fishing into account in redesigning the saloon. While the sole is carpeted, the flooring beneath it has the same fiberglass nonskid as the cockpit. So if you don&apos;t want to mess up your interior, just pull up the carpet and leave it at home. As someone who is admittedly not always neat when the game is aboard, I particularly like this idea. CD player sit conveniently high on the starboard side, with TV viewing equally good from port or starboard. The galley is just as cozy as the sleeping arrangements, thanks to a teak and holly sole, cabinets with teak inlays, and ample overhead lighting above the cooking area and counters. There&apos;s also plenty of room to cook and prepare meals, given the two-burner stove and microwave, deep stainless steel sink, Sub-Zero refrigerator/freezer, Corian countertops, plenty of cabinets and drawers, and an optional icemaker. And finally, it&apos;s nice to know that Herndon paid attention to the 35&apos;s engine room. Access is uncomplicated and comfortable, with entrances from the cockpit and the saloon, the latter available by just pulling back the carpet and removing a two-foot-square hatch. Inside I had no problem making my way around the optional twin 420-hp Yanmar diesels. Although primary access is through the cockpit engine covers/seats, you can access your salt- and freshwater washdown pumps, alternator, belts, and the like through here. The area is well lit with three 12-volt fluorescent lights. But seeing all of Herndon&apos;s changes was one thing; feeling them was another. I took the 35 into 10- to 15-mph northwestlies and a two-foot swell, so I can&apos;t attest to her big-water capability. With her fuel and water tanks full and three aboard, she made almost 36 mph. I was impressed with her handling, as she turned easily, rode solid, and took what swells there were like a champ. The Hynautic steering was smooth, as were the Panish controls. I liked the optional Glendinning engine synchronizer, which made moving through rpms a snap. The helm console was clean, even though Phoenix eliminated the overhead electronics box and put everything there. Our boat wasn&apos;t short on electronics either, with a Northstar 952XD, Furuno Color Sounder FCV5821, Furuno Radar 1932, Datamarine depth 3001, Simrad autopilot, and Icom VHF. Sightlines were clean over the bow, whether I was seated in the helm chair or standing. There is seating for about six in front of the helm. 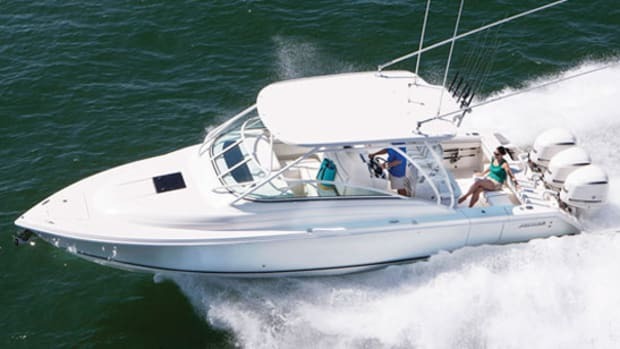 The Phoenix 35 Flybridge Convertible is sleek, fast, and was clearly designed to fish the blue water, although she can be cruised, too. Her dimensions make her easily handled by a couple. I only wish I had time on her in more challenging seas to better judge her handling. The 35 is certainly proof that this Phoenix has risen from the ashes, and while no one can say if the company will exist for 500 years, right now its future is burning bright. 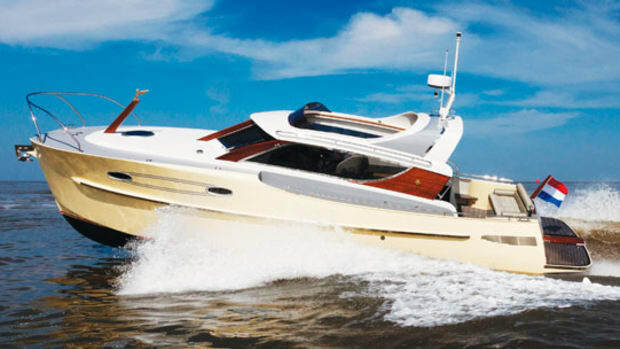 Jupiter Marine/Phoenix(954) 525-6314. Fax: (954) 523-9390. www.jupitermarine.com. Optional Power: 2/450-hp Cummins 6BTA or 2/450-hp Cummins 6CTA diesel inboards; 2/385-hp or 2/420-hp Caterpillar 3126 diesel inboards; 2/420-hp Yanmar 6LY2-STE diesel inboards. This article originally appeared in the March 2001 issue of Power & Motoryacht magazine.